A researcher wades into the Yakima River, where water temperatures have hovered in the 80s this summer. The saying "still waters run deep" doesn’t apply to the Yakima River. Especially this summer, where still waters run shallow and hot. As flows declined and air temperatures hovered at 100 degrees, water temperatures near Prosser mirrored those on coastal Hawaii. Warm water is becoming all too common in the summer months. So much so, that we have teams floating the river to document refuges of cooler water -- places where fish can hang out to avoid the heat. These safe havens may prove crucial to fish survival. 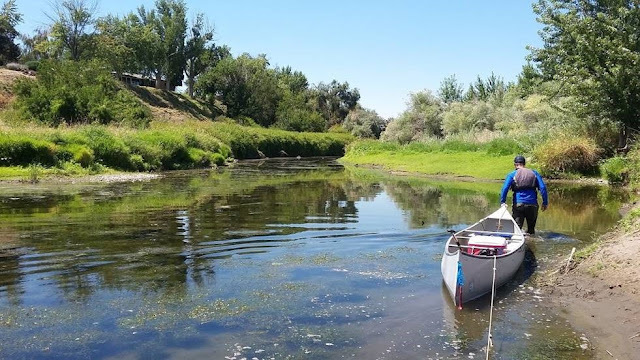 Led by folks with the Benton Conservation District, Yakama Nation, and U.S. Geological Survey, the goal is to profile these cooler areas and gain data for the lower 100 miles of the Yakima River. Funded by Ecology, the survey will help us protect these sites and meet environmental enhancement objectives of the Yakima River Basin Integrated Plan. A record year for water temps? For 12 days this July (2018), average daily river temperatures at Prosser were above 80 degrees! Historically, the monthly mean temperature for July at Prosser is 69.3 degrees. Over the last four years, the rise in river temperatures is notable. In fact, 20 of the 30 warmest river temperatures recorded since 1990 at Prosser were from the years 2015 to 2018. These “thermal blocks” are stalling the migration of sockeye salmon. Recently reintroduced to the river by the Yakama Nation, the sockeye are pausing their migration, waiting at the mouth for conditions to improve. Why? Temperatures above 73-77 degrees are considered lethal to salmon. Survival of late spring smolts is also influenced by rapid water warming, especially in drought years. Where are the safe havens? Fish are able to detect water temperature differences within a half a degree. They move to areas that are cooler and more favorable in an activity called "behavioral thermoregulation." Of all Pacific salmon, sockeye prefer the coldest water. Enhancing thermal refuge locations on the lower Yakima may support late spring and summer migration of anadromous species when water temperatures are otherwise too warm for fish passage. Benton Conservation's water resources specialist Marcella Appel is leading the multi-agency project to map the thermal profile of the river from Wapato to Richland. Data will be used to identify areas where cool water is introduced to the river, be it from shallow groundwater or subsurface flows influenced by irrigation. It’s also believed these refuges provide beneficial warmer water for out-migration of juvenile smolts during the winter and spring months. The conservation district, Nation, with Ecology staff and local community volunteers, have completed eight of nine floats, already covering 80-plus river miles. The study team has one more float to log information, planned in early September. They will map the river again in 2019, and then report on the data and potential next steps to preserve these areas. With anticipated climate change impacts in the basin resulting in higher river temperatures and lower springtime flows, thermal refuge locations will become increasingly important for migratory species. So stay tuned for results. “The support and collaboration for this project have been amazing,” Appel said. “We could not have completed the rigorous summer float schedule without the help of our partners and local citizens. “It is satisfying to see everyone working together on solutions for the lower Yakima River. I look forward to the next phase as we analyze the data. We anticipate the efforts of this two-year study will lead to future projects aimed at helping cool water species navigate an otherwise hot river,” Appel concluded. 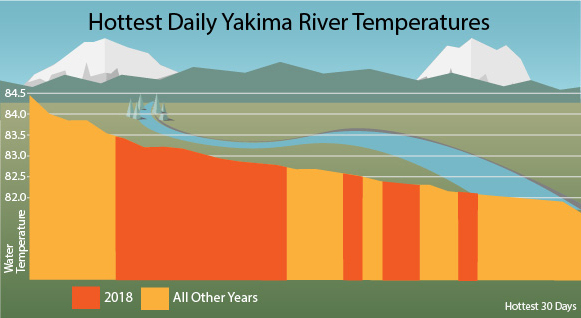 This summer we saw 12 of the 30 hottest river temperatures ever recorded at Prosser.